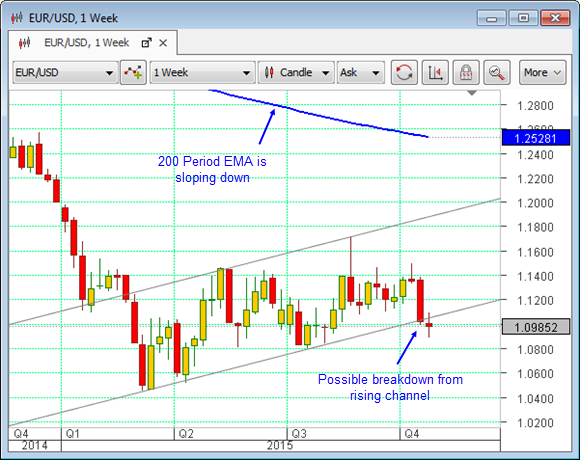 If the EURUSD pair finishes down today, Friday, it will have completed a second week outside the lower bound of its most recent upward rising channel, which came into effect in the first quarter of this year. The latest accelerant for this move will have been the US Federal Reserve FOMC monetary policy announcement on Wednesday, which was unexpectedly hawkish and therefore a positive for the dollar. In addition to a possible break to the downside of the channel, it can be seen from the chart above that the 200 period Exponential Moving Average (EMA) on the weekly chart is sloping downward. This indicates that the dominant long-term trend for the Single Currency is down. Constructing trend channels of this sort is not an exact science and, while there is now the inevitable chatter on the wires about the possibility of Euro-dollar reaching parity, this has happened before and the Euro has always proven to be resilient, to say the least. If this year’s upward trend has indeed been broken, then the next significant support level for this pair is at the 1.08 round number. After that. 1.0463, or the low set on the 8th March of this year, becomes the one to watch. The economic release that will tell the tale next week for the EURUSD pair is the US Nonfarm Payroll report, out on Friday, although Thursday sees the monetary policy statement, Interest Rate and Asset Purchase Facility decision, as well as the minutes of the Monetary Policy Committee (MPC) meeting, from the Bank of England. Any surprises here will also impact EURUSD.